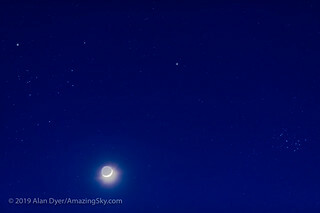 The 4-day-old waxing crescent Moon on April 8, 2019 with it below Mars (at top) and the star clusters, the Hyades (at left, with reddish Aldebaran) and Pleiades (at right) in Taurus, and set into the deep blue evening twilight. This is with the 135mm Canon telephoto at f/2.8 with the Canon 6D at ISO 400, in a blend of 7 exposures from 1/4 second to 8 seconds, blended with luminosity masks from ADP Pro3 extension panel in Photoshop, to prevent the Moon from being too overexposed while retaining the stars and blue sky. The camera was tracking the sky. I added an Orton effect glow to the stars for artistic effect, with a star mask to limit the glows to just the stars. I really needed a 105mm lens for this, as the framing is pretty tight! Oh, well!